Adding protein in the form of a mass gainer can help you gain weight and a more muscular physique. 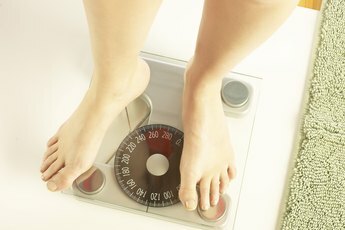 Metabolism and weight go hand-in-hand, and those with a fast metabolism generally have a thinner physique. While some people may enjoy this naturally slim figure, it can cause trouble for those who are trying to put on weight by increasing muscle. But not to worry, there are supplements you can take that give you extra protein and calories so you can gain a little extra weight in the form of flattering muscle. Whey protein can help support muscle tissue and casein protein can help preserve muscle. 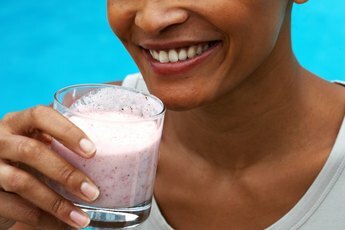 While there is some debate over the benefits of whey versus casein when it comes to their effect on weight, there is no conclusive evidence indicating that either the slowly absorbed casein or the quickly absorbed whey impact metabolism any differently, according to Michael A. Smith, MD. However, protein consumption in general can suppress your appetite, says strength and conditioning coach Reuben Bajada. This effect may last longer with casein since it is slowly absorbed, which may prevent you from eating as much as you would need to in order to put on more weight. So for this reason whey protein is the best choice. The National Strength and Conditioning Association recommends that active adults who participate in strength-training consume between 0.4 and 0.6 grams of protein each day per pound of body weight. Full time athletes should consume up to 0.8 grams per pound of body weight per day. Calculate your daily protein needs based on your body weight and activity level and then divide that number by the number of meals you eat each day including the number of protein shakes you want to drink. This will tell you how many grams of protein you need in each shake. Choose a powder that brings you close to this number with one serving or adjust the portion size accordingly. Consider the number of calories in your mass gainer, since increasing your caloric intake is the key to weight gain. You need to consume an extra 3,500 calories to gain one pound. Mass gainers are a good option for those with a fast metabolism since they are high in calories, some can have up to 2,000 calories per serving when mixed with milk, and they are made up of protein, carbs and healthy fats. To gain a pound a week, the average person should consume an extra 500 calories per day beyond her caloric maintenance level. If you are using a mass gainer to get in the extra calories, choose one with no fewer than 500 calories per serving. Consult your doctor before using any supplements to make sure they will not interfere with any medications you are taking or health conditions that you may have. While mass gainers can help you build muscle and put on healthy weight, they should be used to supplement a nutritious diet and not as meal replacements. Always read the label carefully before taking any supplements to make sure you are not allergic to any of the ingredients. Building Muscle Worldwide: Question: How much protein can be absorbed at one time? Davey Wavey Fitness: How Much Protein Can Your Body Absorb at Once? Muscle & Strength: Gaining Weight The Healthy Way! Can Nuts Help You Gain Muscle? Do Mass Gainers Make Your Metabolism Slower? Do Thermogenics Get Rid of Your Natural Metabolism?